Laughlin AFB is the largest pilot training base in the USAF and is located in Del Rio, Texas. The host unit on base is the 47th Flying Training Wing of the Air Education and Training Command. 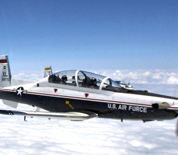 Currently the aircraft flown at Laughlin include the T-38, T-1A and the T-6. The primary mission of the base is undergraduate flight training. Laughlin is situated just north of the Rio Grande and the US border with Mexico. The nearby Lake Amistad reservoir is a site for many recreation opportunities including water sports, boating, fishing and camping. Del Rio is also home to the annual George Paul Memorial, also known as the Super Bull, the longest running bull riding event in the world. This Laughlin AFB directory features the critical info you’ll need to navigate through the many facilities and recreational opportunities available on base.